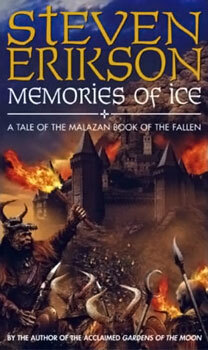 So far I have to say that this book, Memories of Ice, is my favorite of the series so far. It was so incredible that I never wanted to put it down. It was filled with intrigue, suspense, and betrayal, and there were times I almost cried. I found this book to be the easiest to read so far. I think if I went back to the other two books I would have a much easier time reading them and even enjoy them more knowing what I know now. In Memories of Ice we pick up where the first book, Gardens of the Moon, left off. Events occur at the same time as events taking place in the previous book, Deadhouse Gates, and if you read carefully there are clues to tell you where you are in the timeline of the second book. The one thing I did not like reading about was the Mhybe storyline. I just didn’t find that to be very interesting. It was just kind of annoying hearing about her complain all the time and her dreaming was just weird. You will understand when you read the book. Trust me. The battles were well written, interesting, and detailed. I felt as if I was in the middle of them. Especially during the last battle. The aftermath was just too horrible and filled with sorrow. I almost broke down several times. I loved being reunited with the Bridgeburners, Whiskyjack, Paran, and Quick Ben (definitely becoming my favorite character!). It was also interesting to learn more about Caladan Brood, Anomander Rake, and Dujek Onearm, as well as learning the fate of Sliverfox (Tattersail). All the characters are so well developed that they become real people and you develop feelings (good or bad) towards them. I have to say that the fate of one of the characters at the end almost left me in tears! It was incredible how the enemies from Gardens of the Moon became allies in this book! Very exciting to see them all working together and how they cope with that. The T’lan Imass were also very interesting and played a larger part in this book as they are being called to a gathering. I loved reading about Tool again! He is such an interesting character. There is probably going to be a book focusing of them because of something a T’lan Imass said in this book. Something about them fighting a war and not with a Jaught. Exciting! Oh! and there is something going on with Toc the Younger. I think he must play a pretty important role at some point. I also enjoyed the villains in the book. We are introduced to the Crippled God and the Seer. The Seer is the main focus of the story with the Crippled God sort of put on the back burner. They are very interesting and well developed and I enjoyed reading about them. We will find out more about the Crippled God later. Throughout the entire book you follow the soldiers as they travel from place to place and attempt to win their battles. This sounds so incredibly boring, but Erikson does a marvelous job making this one of the most incredible series I have ever read. He really knows how to write! He is an amazing storyteller. It’s his characters and the stories behind them that make the book so interesting. I can’t wait to read the next book!